There are films and television programs created on firefighters and on what they do for a living. Awed preschool children, when asked what they want to be in the future, could pipe up with “I want to be a fireman,” and dress like their heroes while out trick-or-treating. All this is testament to the job of a firefighter. They are practically heroes without capes, out directly where the action is, and in the business of saving lives. The children that grow up pursuing this preschool ambition have a sense of obligation to their fellowmen, because their duty as firefighters is a service to their communities. 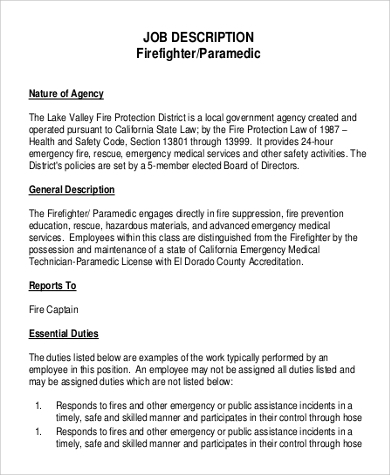 To know more on their work, see these Job Description Samples. The CTIF International Association of Fire and Rescue Service is an international organization that bridges cooperation among firefighters around the globe. Broadly, the organization arranges conferences and presents data and statistics on worldwide firefighting. In one of their published 2016 reports, CTIF’s statistics listed that in the years from 1993 up to 2014, there were 2.5–4.5 million incidences of fires in 57 countries. 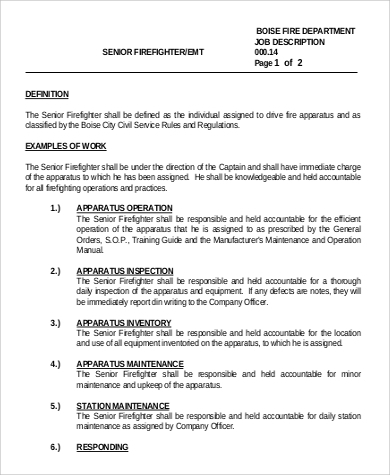 creating and submitting reports on the incidents. 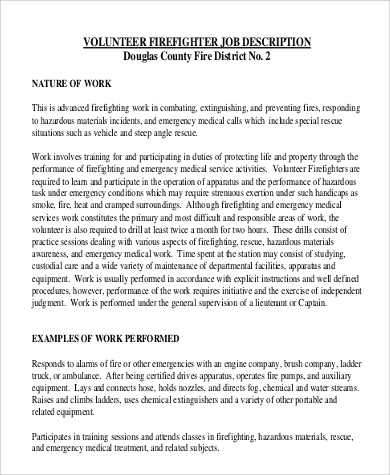 As firefighters work for their respective local governments, they are also responsible for educating their communities on preventive measures and fire safety, and for conducting fire drills. 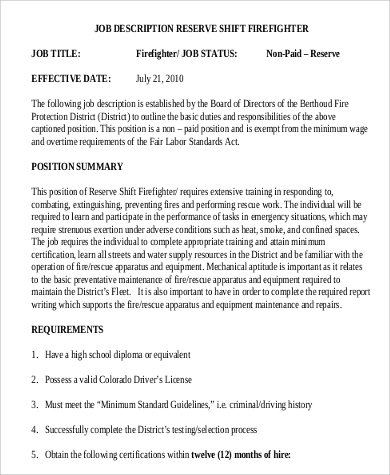 The minimum educational requirement that a firefighter needs is a high school diploma. It is preferable, however, that s/he has taken further vocational or technical studies on firefighting technology or fire science. This is then followed by written and physical examinations that should demonstrate the required level of skill and aptitude. 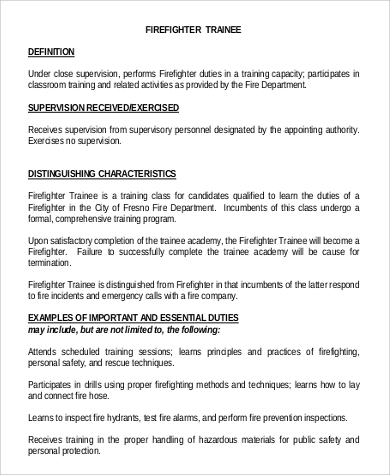 Upon getting the post as a firefighter, one is submitted to a series of training. 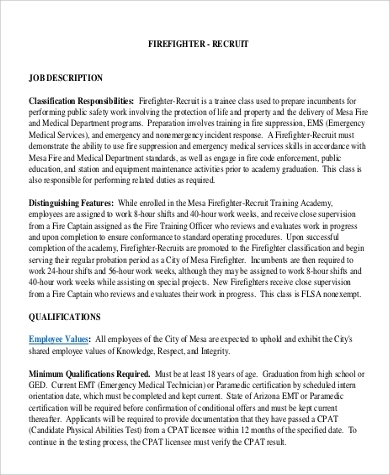 Aspiring firefighters that already have backgrounds on CPR and emergency rescue operations are also more ideal. 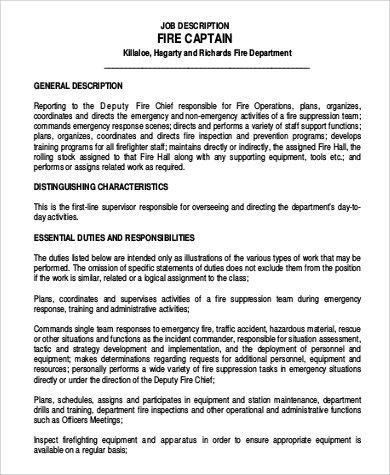 So are those who have had previous experience volunteering at firehouses. 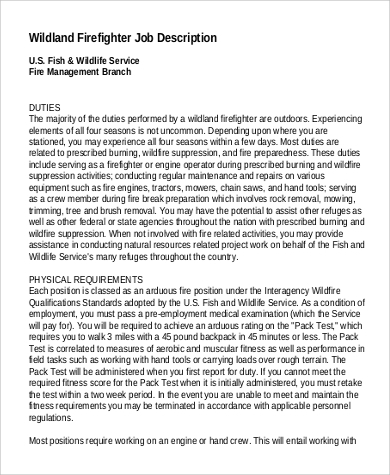 The job of firefighting belongs to the list of service-oriented work and trade. For reference on another, although dissimilar job in this category, see Hostess Job Description Samples. 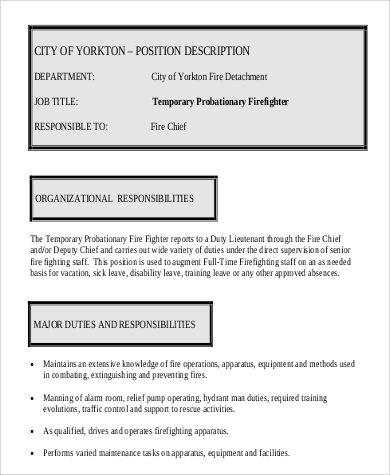 The templates above list in great detail the qualifications they expect from, and the responsibilities they expect of potential firefighters. 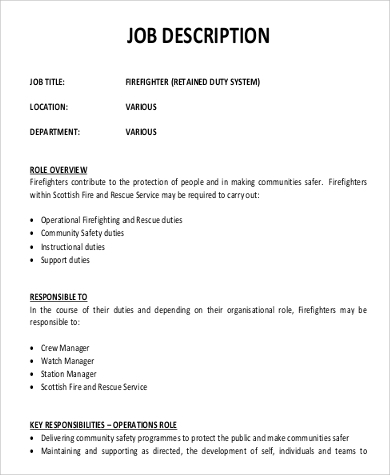 For further guidance on the job, see these Job Description Templates.